Opened in 2011, the Integrated Transport Terminal Bandar Tasik Selatan (ITT-BTS) was designed to alleviate the infamous traffic congestion around Kuala Lumpur’s largest transportation hub, Hentian Puduraya. The state-of-the-art facility encourages people to use a modern, efficient and reliable bus services to the southern states of Melaka, Johor and also Singapore. Linked to no less than three nearby train stations and accessible from two major highways, ITT-BTS is a six-storey terminal with parking bays to accommodate up to 100 buses at any given time. In addition, the terminal is home to more than 60 retail outlets, ranging from coffee shops to upscale fashion boutiques. 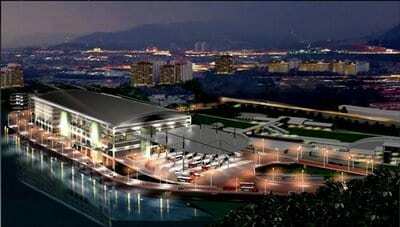 This mammoth RM570 million terminal complex spans 49 acres with part of the complex built over the lake. It has six floors, 55 bus platforms, 150 taxi bays, 1,000 parking bays and 1,800 seats in spacious air-conditioned waiting halls. With up to 100 buses arriving and departing at any given time, accurate information must be displayed throughout the entire facility and be updated virtually instantaneously in the event of schedule changes. Given the nature of Kuala Lumpur traffic, it’s not possible to predict with great accuracy when a bus will arrive at the terminal. In addition, it’s important to let travelers know when a particular bus has departed, when the next bus will be leaving for the same destination, and the availability of seating. Directing relevant information to specific, designated points within the terminal meant that any public information display system (PIDS) employed would have to integrate with the existing ITT-BTS operating system, which monitors all buses through a sub-system that scans number plates as buses arrive and depart the terminal. The sheer size and scale of ITT-BTS means tremendous volumes of information must be disseminated over a wide area, including public address announcements and emergency services information, as well as arrival and departure notices. Finally, the 60 retail outlets operating in the terminal need an effective method of advertising goods, services, promotions and special offers to a captive audience. A highly flexible, dynamic solution was required to meet all these communications issues. Click the link below to download the full ITT-BTS case study.